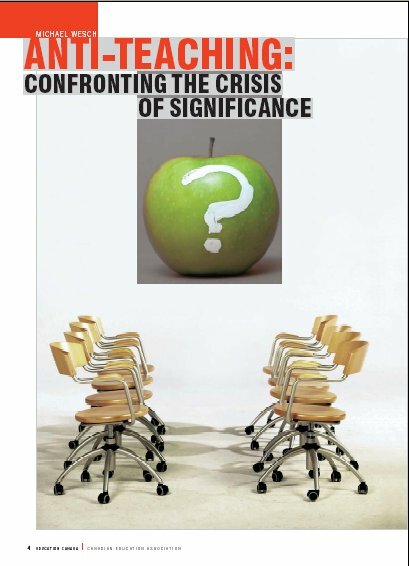 although I downloaded the article as soon as it appeared online, I just read Anti-Teaching: Confronting the Crisis of Significance this past weekend. I had my usual lapsus calami and for the nth time this year, questioned what I do. Like Mike Wesch, I teach at a large public university. Also like Wesch, I teach, for the most part, required courses for which students put in a minimal effort. Unlike him, I do not have large classes, because they are capped at 25 (though they usually are closer to 30). Unlike him, the content being delivered is in a foreign language and one thing that I have discovered with each passing year is that if a student takes degree requirement courses reluctantly in English, many have an even stronger aversion to those offered in foreign languages. The excuses range the gamut: I’m not good at languages to why should I study languages? everyone speaks English. I applaud Wesch for what he does in his classroom—he wants his intro to Cultural Anthropology students to co-construct knowledge about different topic areas, not only to explore them, but to live them through World Simulation. As I read the brief methodology he presents in the last paragraphs of his article, I chuckled to myself: not because I dismiss it but rather because I embrace it. I have been using such a technique, under the guise of foreign language level-appropriate communicative activities. Since the 80s, foreign language educators have been trying to encourage students to simulate various scenarios that they would encounter if they were in an environment where the foreign language is used. Providing students with authentic input (this is where the Internet as a “medium” helps students get “the message”) and having them attempt to negotiate meaning and construct knowledge is at the base of each and every lesson. Ask any of my students if they are able to sit where they lay their backpack in my class, and the answer is no. They move around a lot, with partners or in groups, working on jigsaw activities, where each student is responsible for becoming and expert on his/her topic then moving on with other groups to share information and knowledge and learn from his/her classmates. They simulate, role-play, discuss, share and reach the objective of the activity, doing this for the most part in the foreign language. The fact that this methodology, these techniques are being implemented in courses other than language courses gives me hope. Why? Because it is not just “those crazy language people” who have unconventional ideas about the teaching and learning dyad. Ay, there is the rub—the out-dated educational model. Students come to my class expecting a lecture … some even in English. Apparently, the grammar translation method to language learning is still alive and well in many classrooms and institutions in this entire continent. We, as a department as well as a united front with other FL departments, have pleaded with the university administration to allow us to address the issue of how foreign languages are learned in the freshman seminar offered to our students. To date, we have been unable to get time in that seminar. This tells us that administrators too are unaware or wish to remain uneducated about acquisition theories and techniques and the role of technology in language teaching and learning pedagogy. Moreover, they fail to recognize that the “lecture” designation given to our courses is completely inaccurate, arbitrary and unsound. So, how can we update this model of education? Do we start at the top and work our way down to the students, or do we start with our students and move up the hierarchy? What do you think?